Now in its fourth issue, J.V. West’s Black Pudding is one of the most entertaining OSR ‘zines going. Each issue offers 28 pages of 70’s-style, DIY dungeon-crawling craziness, prizing imagination over logic and fun over complexity. And while every Black Pudding feature may not fit into every OSR campaign, West’s rapid-fire writing, exaggerated illustration, expressive hand-lettering (yes, West letters most of the content by hand!) and absolutely unfettered creativity makes every page a hoot to read for anyone who appreciates D&D the way they played it in Lake Geneva. Certain features appear in every issue of Black Pudding. “Meatshields of the Bleeding Ox” offers eccentric NPC retainers for PCs to recruit, each with personality notes, stats, and an illustration. Every issue details several new and often very strange monsters, along with truly unusual magic items. Each issue also includes at least one short adventure, presented in ready-to-run format across one or more information-packed pages. Black Pudding presents new OSR character classes as well. Some, such as issue #1’s Chainmail Chick and #3’s Luchador, seem comical or satiric in nature. Others, like the Blind Guardian and Summoner, both in issue #2, could fit comfortably into the most serious OSR campaign. But silly or straight, all the classes in Black Pudding are written with sufficient detail for most OSR rule sets. West’s highly original, hand-drawn OSR character sheets are highlights of every issue of Black Pudding. The right character sheet enhances your sense of who and what your character is, and West’s unique sheets manage to be evocative and usable at the same time. Every Black Pudding includes at least one character sheet, and most include two. They are all worth printing and using. Black Pudding #1 opens with a concise rundown of OSR house rules used by the Doomslakers, West’s own gaming group. No less than six new OSR classes are included. West clearly based two tongue-in-cheek archetypes, the Chainmail Chick and the Sinewy Barbarian, on Red Sonja and Conan. The Catgirl and Barbaribunny are fun to read, but are useful only if your campaign has room for anthropomorphic animal PCs. The Black Knight is West’s take on the classic anti-paladin, while the Sword Slinger is a duel-wielding blademaster. A collection of named magical swords, “Iron Devils,” supports the Sword Slinger class. Finally, West gives us his highly-detailed version of the Witch, a magic user with a very different flavor. The “Black Bestiary” offers eight original monsters, with illustrations, write-ups, and OSR stat blocks. The comic-book style of West’s text and illos may give you the impression that these are not intended as serious foes, but your players won’t feel that way while they are being crushed by a Gravity Guard or sucked dry by a Cattarusk. You might want to tone down their save-or-die attacks, but otherwise, these monsters are ready to rock in your OSR campaign. BP #1 includes two linked one-page dungeons which pit the party against nobberlochs, the noxious servants of K’lixtra, the Mother of Vomit. West presents “Buried Temple of K’lixtra” and “Crypt of the Worm Idol” as richly-annotated maps, a convenient format for gamemasters at the table. “Buried Temple” is the longer adventure, and might take a couple of sessions to complete. “Crypt of the Worm Idol” has fewer rooms and monsters, and should play out in a single evening. The final reward in “Buried Temple” is the Glittering Tome of the Silver Sage, a wizard’s spellbook containing 11 new, silver-themed spells. Either dungeon stands as an isolated adventure locale, or you can use them as separate but linked areas in a megadungeon. BP #2 brings six more classes, another new spellbook, six original monsters, and two adventures. The classes start with the Keeper, a nature-loving archer, and the Blind Guardian, a righteous defender of Law. The roguish Werewolf Hunter is a relentless tracker of lycanthropes. The Mouldwarp is an anthropomorphic mole well-suited to subterranean adventuring. As a specialist mage, the Summoner concentrates on summoning and controlling monsters. The Fey Savage combines barbaric fury and fey caprice into four feet of half-blooded mayhem. Though the Werewolf Hunter, Mouldwarp, and Fey Savage are one-note classes more suitable as NPCs, the Keeper, Blind Guardian and Summoner would make interesting PCs. Although the “Black Bestiary” heading is missing, BP #2 offers six new monsters across three pages. Again, don’t let West’s retro-comic artistic style dissuade you from using these weird new beasties to surprise and confuse your players. “Elegrain’s Fearful Book of Death” holds 6 new, death-themed spells, along with clues to two ancient magical relics. The Fearful Book could serve as a major maguffin for wizardly PCs interested in cheating death itself. Issue #3 delivers five new OSR classes, eight original monsters, one adventure, and a couple of pages of table-based old-school madness. The issue’s classes start with the Luchador, an OSR adaptation of Mexico’s masked wrestlers possessing several special attacks. The Shield Maiden comes off as a more enlightened version of the Chainmail Chick from BP #1, and is supported with a collection of unique magical shields. With the Medusa, West offers a monster turning over a new leaf, struggling against her inhuman nature. The Raven Heart turns Goth teens into jaded magic-users bored by their own sadness. Most interesting of this lot is the Star Wizard, a magic-user with the ability to commune with sentient stars. The class is accompanied by advice on creating stars as powerful astral entities. In the issue’s adventure, “Into the Nest of the Doppelgangers,” the PCs must expose a colony of body-snatching shapeshifters that have taken over a bridge across a deep river canyon. The adventure is system-neutral, which really means it’s written without stat blocks. Set this adventure up by leading the PCs to cross the bridge several times before the doppelgangers seize it. The adventure will be more compelling if the victims are NPCs the party knows and likes. Black Pudding‘s “OSR Play Book” takes up fifteen pages of issue #4. This comprehensive rules reference presents a virtually complete RPG in West’s distinctive style, hand-lettered and lushly illustrated. It might not be sufficient for players new to d20-style roleplaying, but for OSR veterans, this play book makes a surprisingly usable rule set. Character creation and classes get most of the attention, and West’s big classes—Fighter, Thief and Wizard—are far more interesting than Gygax’s original versions. Just two new classes appear in the issue, both more likely to suit NPCs than player characters. The Elementarian is an alternate elf class (Black Pudding follows the race-is-class convention of white-box D&D) whose main talents are pretense and condescension. The Jungle Lord is a vine-swinging Tarzan homage, loosely adapted for OSR play. “Meatshields of the Bleeding Ox” offers a record-setting pool of 14 potential hench-persons. Unfortunately, the issue has room for just one new OSR character sheet, instead of the usual two. Finally, “Blackbird’s Cave” appears as the issue’s only adventure, presented as an annotated side-view adventure map. In this outing, the PCs must deal with the Lord of Blackbirds, and a flock of 101 demonic crows. “Blackbird’s Cave” should provide a full evening of play, but the party should bring rope–there are a lot of vertical passageways in this one! All I can say is that Black Pudding is my new favorite dessert. Even if it was “just” an entertaining read, Black Pudding would still be worth downloading. It has a stronger sense of identity, and a more consistent tone, than any OSR ‘zine except for Wormskin. West’s rich, dark sense of humor and fun infuses the writing throughout. Visually, every page is a treat. The illustrations surpass the quality of OSR rulebook art from the seventies, without losing the raw spirit of wonder those original artists conveyed. West’s own work stands out particularly, reminding me of artists like Phil Foglio (What’s New with Phil and Dixie, Girl Genius), Kyle Miller (Toon), and David Trampier (AD&D), and especially animator Ralph Backshi (Fritz the Cat, Wizards). But underlying the amusing text and evocative illustration lies a deep understanding and love for OSR gaming. In every issue of Black Pudding, West and his collaborators offer us a heaping serving of genuinely useful material, which we can readily use to enhance our ongoing OSR campaigns. 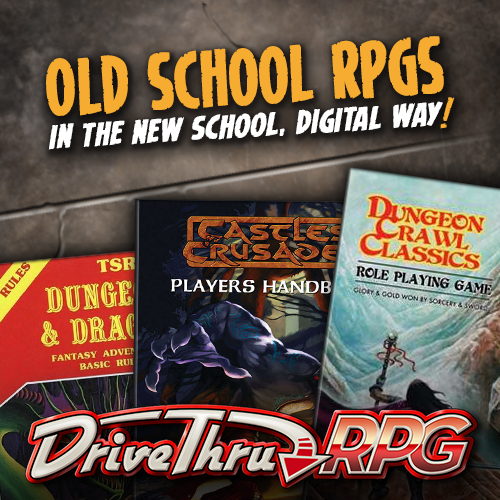 Since every issue of Black Pudding is available as a Pay What You Want product at DriveThruRPG, there’s no reason not to grab them all. In order to keep them coming, I’d suggest tossing a couple of bucks per issue to Random Order Creations. If you’re skeptical, download one issue for free. If you like it, kick in a few bucks when you download the rest. I’d recommend starting with BP #4—its “OSR Play Book” has the highest density of directly useful material. You’ll be glad you did! James V. West was kind enough to mention this review at his blog, Doomslakers, where he pointed out a couple of inaccuracies. One of them—in which I erroneously claimed there was a Cleric class in the OSR playbook in BP #4—I corrected in the text above. The other was that in some features, where I thought the text was hand lettered, it was actually a typeface which looks hand lettered. Since I think the hand-lettered look is an integral part of the design and nostalgia of Black Pudding, which reminds me of the margins of my high school notebooks from 1979-1980, I let that error stand. In any case, if you want to learn more about what James is up to, definitely check out his blog, doomslakers.blogspot.com! Found your blog thru your review of Black Pudding. BTW – you misspelled your URL in the review! Nice look at the zines – and nice blog. Thanks for the kind words, Juju. Of course, it’s easy to write about good stuff like Black Pudding, as you might imagine. I’ve scanned the review several times, and I don’t see where I even included a URL, let alone misspelled it. Can you clue me in to where you saw the error, so I can fix it?